Angela J. Davis (left) and Loretta Lynch in Bender Arena. 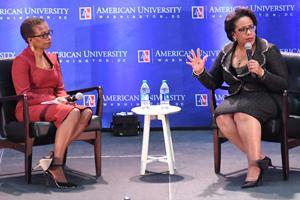 On Friday, October 19, the Kennedy Political Union hosted former Attorney General Loretta Lynch in Bender Arena at American University. It was a celebratory event, part of a special All-American Weekend that welcomed AU alumni, families, students, and community members. This year is also the 50th anniversary of KPU, the student-run lecture series that’s brought so many national and world leaders to campus. With an appearance by Lynch, the first African-American woman attorney general, AU enjoyed the company of another historic changemaker. In her introductory remarks, AU president Sylvia M. Burwell drew a connection between Lynch and another former attorney general, Robert F. Kennedy, who ran his groundbreaking but fatal presidential campaign in 1968. KPU was founded that same year and named after the Kennedy family for their commitment to service. Event co-sponsors were the AUSG Women’s Initiative, the AU NAACP, the Phi Alpha Delta fraternity, the AU Pre-Law Society, and the She’s the First organization. American University Washington College of Law professor Angela J. Davis moderated the discussion. Here are 10 memorable insights from Lynch.